Timber has a very low embodied energy. It basically consists of the energy to process the timber and deliver it. Even when imported it travels mainly by ship which is an advantage in terms of embodied energy. This contrasts sharply with the energy that goes into making bricks, blocks, metals, plastics etc. Embodied energy figures for timber are available on the ICE website. Typically timber is 8.65 MJ/Kg. However the figures on the ICE web site don’t differentiate between timber which on the one hand may have travelled thousands of miles and been kiln dried, and on the other hand may be locally grown timber used green such as with some types of oak frame. There don’t yet seem to be studies which compare the two. It takes up very little of the wall thickness of a building compared with, say, blocks or brickwork so it allows more space for insulation. Timber is structurally very efficient, especially when in the form of engineered timber. Extremely few hazardous chemicals need to be used in timber construction. The waste from timber manufacturing is useful rather than being a problem. For instance it may be used for manufacturing MDF or for powering the sawmill and kilns or be converted into wood pellets for heating. At the worst it may go for paper making. It can be reused several times. For instance, many of the ancient houses in the Shambles in York, which attract so many tourists, actually incorporate structural timber member which previously came from dismantled ships. On your building site there doesn’t need to be much wastage of timber. Short offcuts can usually be used for noggins or bits of outbuildings or landscaping features. Or finally to make the compost heap. Since the introduction of the FSC (Forestry Stewardship Council) Woodmark scheme and PEFC accreditation it is possible to verify that any given piece of timber has been sourced sustainably. This is because it relies on a ‘chain of custody’ scheme which follows the timber from where the tree was felled right through to the point of final purchase and stamps each piece of wood as it is sawn into smaller pieces or put through a manufacturing process. This system works well in practice as can be seen, for instance, from the way that B&Q source their timber. Various other timber merchants are now becoming serious about the Woodmark. Timber from tropical rain forests is a tricky matter. See for instance the FOE report about timber sourced in Malasia on this. Currently EU legislation is being introduced to prohibit the sale of illegally logged timber. See EU Timber regulation coming into force 3rd March 2013. The UK seems to have a rather backward, or at least over-cautious attitude towards timber construction and this is outlined here. There are tens of thousands of species of hardwood in the world and several hundred species of softwood so it’s a big subject. Traditionally it has been initially based on a hardwood / softwood distinction with hardwoods only being graded according to visual qualities and softwood according to either visual or strength (depending on whether it was to be used for structural work or furniture/visible joinery). The traditional ways of grading timber have been rather inconsistent and are being replaced by European standards. You might be confronted by either the new or old standards (or both) for some time to come. The old standards were based on the exporting country’s historical standards. The hardwoods tended to follow the American system and the softwoods mainly the Nordic system with a bit of the slightly different Russian system thrown in. The US tends to export high quality hardwood in the two combined grades of firsts and seconds (FAS). This is also used quite generally by UK timber merchants and there are several web sites with excellent images of different timber grades. The Swedish / Nordic grading of softwoods. These systems are very similar and divide the boards into 7 visual grades. The first four top grades are usually lumped into one known as unsorted (US). Grade 5 is the sort of thing knotty pine furniture is made of, grade 6 is about fencing grade and grade 7 is rougher stuff suitable for packaging or crates. The timber may also be stress graded for strength when it enters the country. The Swedish grades tend to be SC (strength class)14, 18, 24 and 30 whereas it is more normal in the UK to use SC 16 and 24. The best softwoods available in the UK are usually collectively called ‘Upper Gulf’ which means they come from areas like northern Sweden, Finland, northern Russia etc. around the Gulf of Bothnia (northern part of the Baltic sea). Timber which is grown in cold climates, especially if it is on the north facing side of a hill, grows more slowly and hence more densely with a higher resin content. It is much stronger and also more durable than timber grown in the UK. There also happen to be a lot more of the older larger trees in these areas than we have in the UK. The Russian softwood grading system (GOST), (which tends to tie in with Finnish export grades) is slightly different from the Swedish/Nordic one in that it has 5 grades. The top three grades usually come as ‘unsorted’. (Russian 4ths is roughly equivalent to Swedish 5ths) They have slightly different grading for pine/larch and spruce/fir. Stress grading is normally carried out after the timber has reached the UK. The new EU rules for grading can be found on the Fordaq site along with several other national grading systems. It gives some explanation about how the old standards relate to the new ones. Redwood means Scots pine (Pinus sylvestris). It may also be called red deal or yellow deal. Pine is generally stronger and heavier than whitewood. knots (alive and dead) Knots are incredibly subjective: They are a natural part of the growth of trees but some people seem to find them offensive and want what is called “clear” timber, ie. without knots. However the knots and burr found in walnut veneer are considered beautiful. Much of this can be traced down through the class system of Europe and its predeliction for demanding what was elitist and difficult to produce unless labour was cheap. Live or firm knots can be very attractive whereas dead knots (which tend to be of two types (loose and rotted) are a bit more difficult and tend to need polyester filler to fill the gaps, (- unless you don’t mind gaps). Knotty pine is usually the Swedish 5ths grade where small live knots occur about every half metre. splits, also known as shakes, if you accept them, are best dealt with using GRPglass reinforced plastic, also commonly known as fibre glass filler with a slightly darker tone than the timber around. Otherwise the board can possibly be resaw along the lenth of the split to effectively reuse it. This is sometimes an option on wide split boards. discolouration due to fungal growth. Interesting one. Habitat furniture did a very smart range of furniture some time ago using Scots pine which had discoloured blue veins caused by fungal attack. Briefly trendy but hard to get right. resin pockets. Many timbers such as cherry naturally exude resins which cause slight marks on the surface. They may interfere with applied finishes such as varnishes but otherwise can add attractive character. woodworm and other creepy crawlies such as wood wasps. Providing the infestation is not active this may not be much of a problem with items such as floors but could ruin the look of furniture even if carefully filled. sticker marks which come from the way timber was stacked when it was drying. This is quite hard to handle aesthetically because of the straight cross line patterns that show through. This is one of the problems with sycamore which is a very light timber, almost white. It has to be air dried by boards being stood on their ends under cover without the boards touching. After that it can be kiln dried using nylon stickers: wood stickers leave marks which go quite deep into the timber. If you should decide to process your own structural timber then if necessary you can employ a stress grader to grade timber visually. They will assess each piece and stamp it accordingly. This will normally be to SC16 or SC24 to meet with Building Regulation strength requirements. There are also requirements regarding the moisture content of the timber during grading. See more here. It will normally only make economic sense to employ a grader if you have enough timber to warrant calling them out for at least a full day’s work. To find a certified strength grader ask around local timber yards. They usually know who is operating in the area. for fire spread, which is to do with how quickly fire can spread across the surface of a wall or ceiling, there are rules about how much timber can be used in various situations. It is possible to treat the surface of timber to achieve a better rating. For instance timber boarding can be upgraded quite easily to class 1 (required for most wall and ceiling situations) using intumescent varnish. while timber is a reasonable insulator (K value about 0.14) it is not as good as people sometimes assume. Until recently, timber used in external walls was ignored for thermal calculation purposes but it is now considered to constitute a thermal bridge and has to be included in the calculations. This is one of the reasons for the recent increase in the use of timber I beamsprefabricated timber beams with a web of OSBOriented Strand Board and softwood flanges. They are very light, efficient and regular which have a thin web. when the wood is under cover, not exposed to the weather and wetting. From the above table it can be seen that Douglas fir and larch are suitable for external cladding provided only the heartwood is used. It also shows that Scots pine, Norway Spruce and sapwood generally is suitable provided severe condensation is not likely or it is not being used in a very exposed situation. Highly exposed situations in the UK are mainly towards the West side of the country (rather than the North) as can be seen from the exposure map in the Building Regulations. This ties in with building practice in Norway where lower grade timber is often used for external cladding, albeit often with a moisture permiable surface coating in exposed areas. Preservatives. Timbers vary considerably as to how easily they take up preservative. There are four classes of treatability ranging from difficult to easy. Wikipedia have an excellent page on timber treatment, although it is based on the US market. There’s a useful durability guide by Inwood which gives ratings for over 150 species. Remedial timber treatment products suitable for use in bat roosts. Natural England Natural England is the government's advisor on the natural environment. It 'provides practical advice, grounded in science, on how best to safeguard England's natural wealth for the benefit of everyone' have an extensive list of suppliers of preservatives. ability to take a finish. This is about how easy it is to achieve a good smooth finish of paintwork or varnish. grain lift. Some timbers, when wetted with paint or varnish tend to lift tiny fibres on the surface and produce a rough finish when dry. This then needs sanding down and recoating. It can happen a second time and need coating again. What furniture makers do (and builders and decorators never seem to know about this) is to first apply a light coat of cellulose sanding sealer. This is easily sanded very smooth using garnet paper and then the top coat of varnish or lacquer is applied. Possibly a second coat for wet areas. Alternately, and more ecologically, the timber can be finished with boiled linseed oil or beeswax. These coatings do not raise the grain and do not need cellulose sanding sealer. Particularly with timber floors the lightness of the colour of the wood can be responsible for a great deal of the reflected light and brightness in a room, especially in the winter months. This can help save on lighting energy. Ash, Sycamore and Maple are good examples of light timbers. There is a general misconception about timber treatment. i.e. that almost all timber is better if treated (meaning treated against woodworm, dry rot and wet fungal decay). This is a blanket approach which does not properly address the needs of the building industry. Instead it tends to promote the widespread use of toxic chemicals when they are not needed. 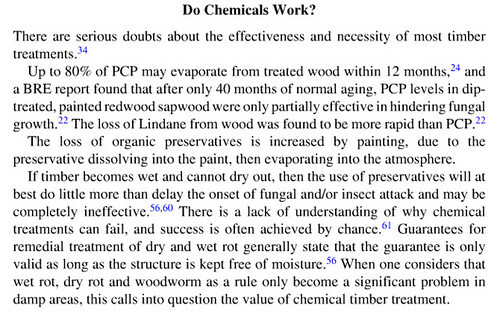 If you are talking about telegraph poles, marine timber structures or agricultural fencing then there may be an argument for using timber which is heavily chemically treated (and there may not). For house building there is a much simpler approach. Timber which is kept at a moisture content of below an average value of about 18% (equating to an indoors relative humidity of about 60%) is extremely unlikely to attract infestations of woodworm or dry rot. If timber is protected from rain and also from internal leaks such as leaking gutters or leaking pipes then timber will last indefinitely; probably many hundred years. There is ample evidence for this. Some of the oldest buildings in Europe are of timber and they have not been automatically treated with the sort of chemicals which are now commonly used on timber. Timber in an inhabited modern house normally has a moisture content of 12%-15% which is well below what will support dry rot or woodworm. However there can be problems with House Longhorn Beetle which has special provisions in the Building Regulations covering a few counties mainly South West of London. The third possible source of problematic damp is rising damp but this is covered by the Building Regulations part CThe Approved documents, (England) part C, deals with Site preparation and resistance to contaminants (C1) and Resistance to Moisture (C2) which insist on a damp proof course (DPCDamp Proof Course - a strip of (usually) plastic built into walls to prevent damp rising or penetrating. see more) between damp ground and the main habitable area of a house. Another possibility is to use acetylated timber. Acetylated timber is softwood timber that has been treated to make it as durable and resistant to rot as some of the best hardwood species such as teak. The technology is based on treatment with a form of acetic acid (which is simply a concentrated form of vinegar and therefore pretty safe). It is marketed as Accoya by Titan Wood Ltd. This is a relatively recent development in timber technology and has strong green credentials. The main drawback, as with much of the timber trade is the long distances travelled by the timber. Titan’s timber sources are global and the only treatment plant so far is in the Netherlands. Pricing is typically two or three times the price of redwood and half the price of oak. Another process for treating timber to improve its dimensional stability and durability is thermo modification such as Thermowood and the Plato treatment sytem which uses no chemicals, simply a special cycle of heating, moistening and drying of the timber. there is a considerable amount of larch and Douglas fir, originally destined for pit props, coming onto the market. This is good, moisture resisting structural timber. quite a lot of Western Red Cedar (Thuja Plicata) normally sourced from abroad, particularly Canada, is coming on stream from UK sources. It is particularly good for external cladding. Finger jointing (the method whereby pieces of timber can be jointed together in an extremely strong manner shown to the right) along with timber lamination which also strengthens and stabilises timber, is revolutionising the way elements of timber are being made. This ranges from small pieces of high quality joinery such as doors and windows to large structural items such as I beams and huge structural laminated beams. Laminated timber is generally well sourced environmentally. However, due to the poor understanding of timber building culture in the UK it has been marketed mainly towards large structures such as offices, swimming pools, theaters etc. rather than the housebuilding market, so it can be difficult to find merchants who are supplying off-the-peg structural members. The Glued Laminated Timber Association has a list of member companies. Also try Panel Agency Limited and Lamisell. How all this may affect the home grown timber market is as yet unclear. Hitherto, home grown timber has been generally of very low market value, particularly with softwood. This has been because of several factors, including the poor planning of which species needed to be grown, the way woodland is used as a tax dodge and the intrinsic lower quality of softwood grown in a warmer climate. With computerised cutting and sorting of timber it is possible for a machine to cut out and reject all the knots and irregular bits of timber and then glue back together all the good bits, even if they are in very short lengths. These can then be laminated with other such pieces to produce very reliable timber sections. A few joinery companies are already moving into this field. For instance Coed Derwen Joinery. See more about this at Woodknowledge Wales. ‘Reliable’ is the important word. For an engineer who wants to calculate the structural strength of a piece of timber it is more important for it to be reliable and consistent in nature than for certain bits of it to be extremely strong. This is what finger jointing, comb jointing and lamination can achieve. The possibility that erstwhile low grade UK timber (which is usually shipped to Sweden for paper making) may become seriously useful and valuable could have an enormous impact on the timber industry within the context of higher carbon prices which affect the way timber is imported. We are sometimes jokingly known as the ‘firewood merchants of Europe’ due to our low timber quality but automation of timber production could make timber as a crop much more valuable. A fairly new development is Baubuche from Polmmeier in Germany, a LVLLaminated veneer lumber. Similar to plywood but without the crossbands. (see Wikipedia entry) material formed from laminates of European beech. This is produced as structural members, panels and flooring. Another factor which is changing rapidly is the rate at which wood stoves are being purchased. People are looking at burning timber for heating and this will become a competing factor with structural timber, along with pheasant shooting, pulp production and general amenity value. A further factor is the relative value of woodland compared with agricultural land. In the UK, woodlands have generally been the areas which could not be used for agriculture because they were too hilly and/or north facing. Hence their value for pheasant shooting. If structural timber becomes a valuable crop, (partly due to computer based handling of timber) then it may even become commercially viable to plant timber on agricultural land. This would pit timber production against meat production. This section, Part C covers site remediationthe term applied to the method of dealing with pollutants and contaminants in the ground. The Building Regulations cover this in detail. See info about Approved Document C – Site preparation and resistance to contaminants and moisture along with protection from nasties which might affect the construction and occupants such as damp, rain, radon etc. There is an abridged version of the Approved Document specially for houses.